Caffè Tempo is an independent mobile espresso bar serving only the very freshest, finest quality premium coffees and teas. We're passionate about coffee and hand craft each and every premium coffee beverage we serve to ensure our customers coffee experience is second to none. Caffè Tempo was established after a tour of Italy 5 years ago. After a lifetime of drinking the usual 'instant coffees' at home I was just blown away by the 'real' coffees that we being served throughout Italy's coffee houses. The tastes, the rich aroma, the style and the presentation were all so sophisticated and expressive of the Italian flair. Sitting, drinking what was the best cappuccino I'd ever tasted I knew I wanted to bring the experience home. I knew it had to be all about the coffee, how a truly great tasting coffee can only ever be created with passion. We take pride in being independent, we're not part of a chain nor do we just serve coffee as an afterthought to food. To have Caffè Tempo at an event is to know a great tasting quality coffee experience is only seconds away. To us serving a great tasting coffee is just part of what we strive to bring to our customers. For a special treat try any of our drinks with a syrup of your choice (vanilla, caramel or almond) or if you prefer a more intense taste ask for an extra shot. If you would like to book Caffè Tempo, or just have a general enquiry, then please feel welcome to call or email. As Caffè Tempo is a mobile espresso bar operating from our specially converted commercial van we can bring our quality coffee experience to almost any event no matter how big or small. Our mobile espresso bar can run from an on-site electrical hook-up or from onboard LPG so we really can operate anywhere independently… we don't use a noisy smoky generator that detracts from your coffee experience! We can operate from almost any size area in a variety of layouts dependant on location and venue. By having Caffè Tempo at your event you'll be sure your guests will be getting a quality coffee that they'll thank you for. Feel free to contact us to discuss your requirements. We'd love to work with you to ensure your event gets the unique Caffè Tempo experience. We only ever use ethically sourced Fairtrade coffee beans. No compromises. Our sugars and coffee biscuits are Fairtrade too. Our supplier roasts the beans to order and we'll only open the beans on the day they're used to ensure freshness and taste. Almost always we'll use organic milk when available. Our mobile espresso bar can run on electric or LPG, it doesn't use a noisy generator! 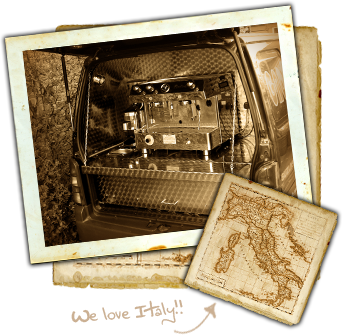 We can operate in almost any location, bringing the Caffè Tempo experience to the largest of events and the smallest of venues. We'll recycle all our waste paper cups, coffee stirrers and paper napkins.